Not a resolution per se, but one thing I’d like to attempt this year, which is different than anything I’ve done before, is to try to get the attention of the goddess Frigg. I’ve never done anything like this before. The only gods that I’ve had “show up” did so completely of their own volition. Or at least that’s the way it seemed. As you can see from my previous post on how I met Odin, I never planned on being an Odinswoman to begin with. I’ve also had dealings with a handful of other gods, and all of them have little statues on my altar. Odin is in the middle, and to the right stands Thor, to the left, Freyr, and then on Freyr’s other side is his sister Freya. I would say of my other gods, Freyr comes second, followed by Thor, followed by Freya. I’m such a tomboy hanging out with the guys all the time! The Freya statue I have is actually the most expensive one I got, hoping that I could have more goddess influence in my life, but that didn’t seem to make much difference to her. That was when I was in my 20’s, and now I’m turning 33 next week. I got married a year and a half ago, and at around the same time we bought a house, and now my husband and I are starting to seriously talk about having a child. I know this sounds a bit Wiccan, but I’m moving from being a Maiden into a Mother, and I really want to have more of Frigg’s influence in my life. I’ve actually been thinking about this for a couple of years, but this year I think I’m going to get serious about it. To be honest, I find Frigg to be intimidating. You’d think that no deity could be scarier than her husband, but I’ve heard from other Odin’s people who agree with me that Frigg is the one you really don’t want to get on the bad side of. Even Odin gets in trouble when he crosses her! I hope that since I already have a good devotional relationship with her husband that she’ll at least hear me out. There are some Heathens who say it’s a terrible idea to try to get the attention of a god on purpose. These are usually the same people who say ordinary people in pre-Christian times only worshiped the ancestors and nature spirits, and the gods only pay attention to really important people like kings. The latter is obviously not true, or at least not anymore, or else the gods would have nobody to pay attention to! As for the former, the reasoning seems to be that gods make your life complicated, so you don’t want to get involved with that. Well, too late now, because Odin’s already done that. I just think that Frigg has certain expertise that would be very helpful to me right now. Of course, I know she’ll want something in return. I can’t just go to her and say, “Hey Frigg, help me be a better wife to my husband and give me a child and make me a great mother!” and not have something for her in return. That’s just rude. I already know some things she likes, just from reading what other Heathens have said. I’ve been told she likes plum wine as a libation (even the Asian brand I can find at the local store), and she likes people to keep a clean house. She likes fiber arts like spinning, weaving, knitting, and crocheting. That’s a start, anyway. For Yule I asked my husband for a few Heathen things, and one of them was this Frigg doll from a shop on Etsy. I ran across this shop searching for a Valknut, actually. Now the shop is closed, and I think I might have gotten her last doll before she closed the shop! That’s a shame, because I thought these dolls were pretty neat. At first I thought it was kind of cheesy, because they’re so “cute”, but I also liked the amount of detail she put into them, like Ullr’s little bow, and Njord’s fishing net. I also appreciated that she made dolls for the lesser known deities like Sif, Ullr, and Njord and not just gods like Odin, Thor, and Freya. 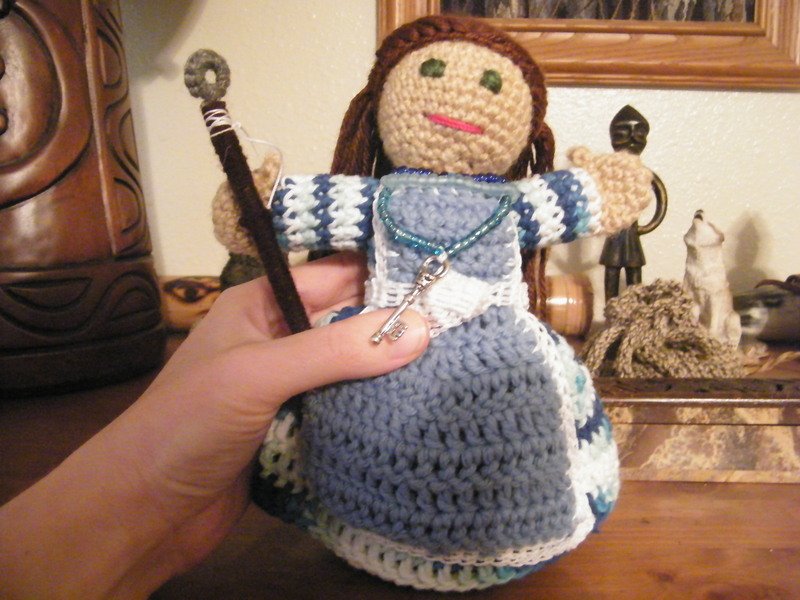 I decided that getting a crocheted doll might be especially appropriate for Frigg, and a nice change of pace from the Sacred Source statues I’ve bought from my other gods. So now she’s sitting on my altar, but I think later she might go on the mantle in the living room so she can look over the house. OK, so I’ve got an altar piece for her, and a plan to give her libations every Friday, plus some housework in her honor. I hope that’s a good start, because if I’m going to end up actually being a mother myself, I am going to need all the help I can get.